Last weekend I took a silver glass class. Silver glass is a type of glass that has metal in it and depending on how it’s worked, can produce a bunch of different colors and finishes. I love the look but I could never achieve it myself. 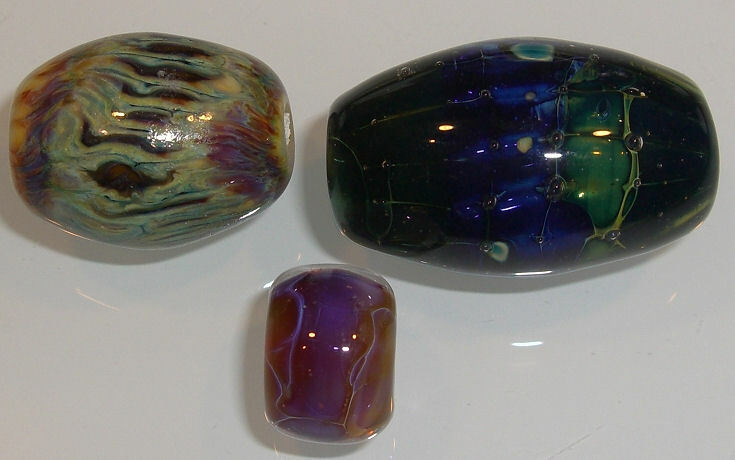 These are three beads I made from the class. They aren’t very good beads but I did learn how to work the glass. It’s always tough making beads in a class, trying to learn a new technique, along with using different equipment. I’m fairly pleased with these and I can’t wait to try to reproduce what I learned at home.